60% Satin and 40% Organza;Dry clean only.The shooting light and setting of your computer screen may cause slight color mismatches. All products are subject to material objects. Wedding dress,Floor Length,Lace double shoulder,Back with bandage. 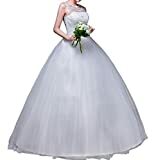 The style of this gown is simple,but full of temperament,very dignified. All our products are made of top quality materials, and with very good workmanship.